After that, I went looking for a simpler pattern with less complications and am now have knit about 1 1/2 feet of the new pattern. It’s nice, just not quite what I had aspired to. Friday was our church’s Wild Game Dinner and this year I worked in the “Pie Room”; I’d estimate we cut around 280 pieces (or more) – 28 trays of 8-10 pieces each, varying the kinds as much as was possible so that each table got a good selection. After that I helped dry dishes and load the dishwasher with tons of silverware. Not a bad job, just kind of yucky – if you figure there were around 280 people there and each person had a fork, knife & spoon (not counting all the workers & their dirty silverware) – it was a pretty slimy job. The dinner was both Friday and Saturday and there were in attendance around 440 guests and who knows how many workers. Lots of variety of ‘wild game’ – buffalo, venison (of course), salmon (hand caught by one of the guys in our church), and lots of other meats. That particular night we had a really nasty snowstorm and I wasn’t able to attend, but as you can see, there was still a great group who played. Our weather has been ‘typical Michigan’ this past week – large snowstorm last Monday (enough for the school kids to have a Snow Day), then relatively mild, then another snowstorm which left about 2 inches (that quickly melted). Tonight it was raining when I came home from church and it is now 36 degrees F. at 10 P.M.! That is unusual for this time of year for it to be that warm this late at night! I’ve heard it’s supposed to get up in the 40’s this week then down to 14! Yep – Michigan winters – gotta love ’em (or, at least tolerate them!). Another big event this past Thursday was my husband’s official retirement dinner. We had a great time; about 30-35 people showed up at a local pizza place and enjoyed great food and a chance to reminisce a little with my husband. On the way home he commented that NOW he feels like he’s retired. He really enjoyed himself. Guess I’d better close this one out; I’ll try to write again soon as I have some more really tasty sounding recipes to share. It’s Michigan – Why am I not surprised? By Saturday of last week our temperatures were ‘decent’, the high winds had blown away almost all of our accumulated snows and the ground was almost totally cleaned of any ‘white stuff’. NOT TODAY! Yesterday we were under a “Winter Storm Warning” which produced a total of about 9 1 /2 inches by late evening. Evening church and choir practice were canceled (I put my warm jammies on and knitted – to celebrate not having to drive in the snow!). We ‘were’ supposed to also get rain/sleet and freezing rain – which didn’t happen! YAY! The weather people were talking about expecting frozen and snapped power lines – so glad that didn’t happen. My husband and youngest son (no school – snow day) went out and shoveled the entire driveway; our great neighbor was out there with his snow blower and cleared our walkway and part of the end of the driveway – an extra blessing! It’s now 23 degrees, sunny and clear – a typical Michigan winter day. Oh well – what else would I expect living in this state at this time of year? Along with all the predictions for the Winter Storm Warning, I got to thinking about a friend’s daughter who is expecting their first baby. I asked him during Sunday School when she’s due (mid-July) and is there going to be a baby shower in MI (she lives in Fla., now)? Yes, but the baby shower is the Saturday before Easter! Checking my trusty calendar, that gives me almost 2 months to knit something. 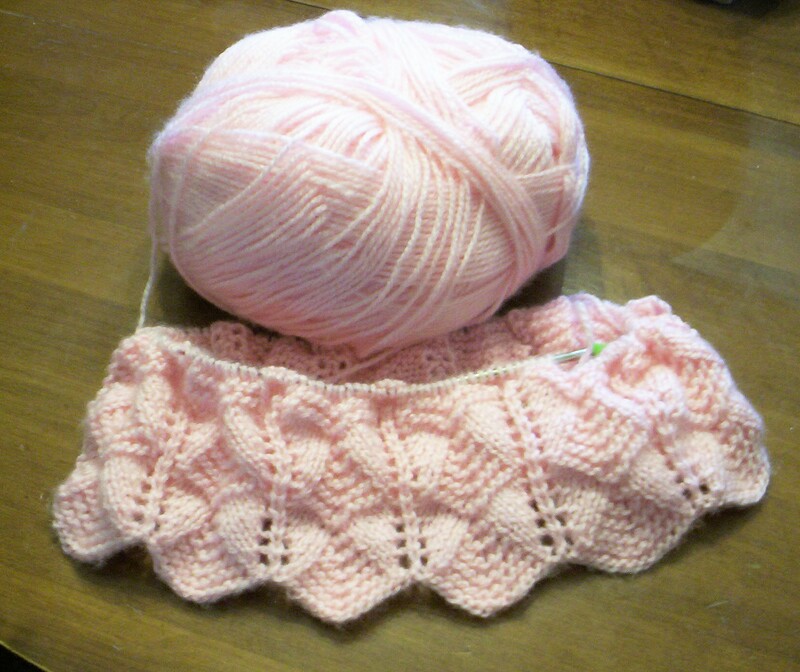 We stopped at JoAnn’s after church and purchased two huge skeins of pink baby yarn (she’s having a girl) and I set out attempting a new pattern I had seen a friend knit. It’s a 16-row pattern (that means it takes 16 rows to make the design, then you just repeat those 16 rows). Not difficult, just lots of concentrating: “Wait! 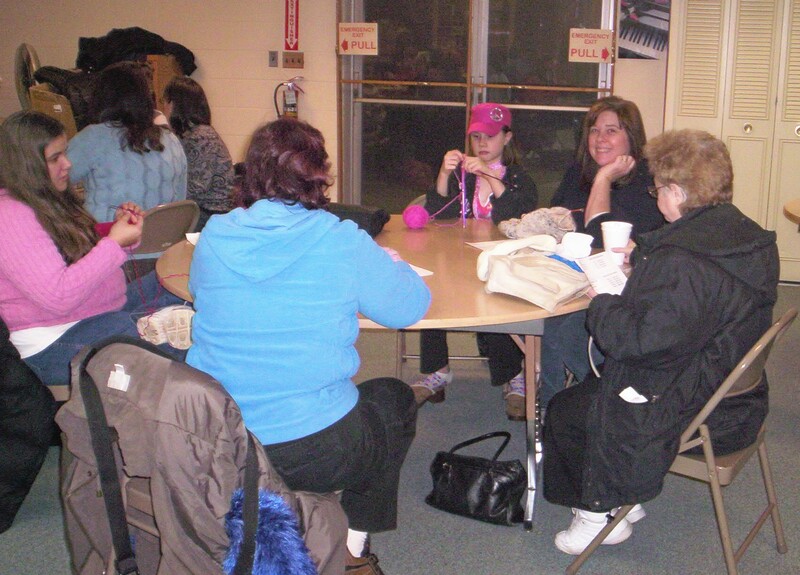 Did I already DO the Purl 2 togethers twice, or just once? Is that Purl 2 the one that comes before or after the other Purl 2 togethers?” (My mind tends to wander when I knit…) Got the whole 16 rows done (YAY!) and began repeating the patterns again. About 4 rows into the repeats, got to the last stitches (was supposed to have 5 stitches left . . . there were only 4). Checked and re-checked all 176 stitches; finally gave up and added one stitch about 3 stitches from the end, then continued on. Had knit about 4-6 more rows when I looked down – the pattern was all shifted over ONE STITCH and it was VERY noticable! UGH! Put it down (more like THREW it down), stomped off and was trying to decide if I even WANTED to continue this pattern, or just rip it all out and find something less stressful. Watched TV, then went to bed. Got up today fully determined to give it another try – ripped out about 6 rows, re-did to the point that I realized I was in the SAME mess, again! UGH! DOUBLE UGH! Walked away, ripped and tried again only to discover that somehow I’d dropped a stitch about 4 rows before! UGH! Went and washed pots & pans, loaded the dishwasher, made cocoa (son) and tea (husband) then tried ONE LAST TIME! SUCCESS!! I’m now into the third row of the repeats, so have FINALLY gotten past that problem! (Not saying it won’t happen again – but I’m definitely going to give myself LOTS of breaks between rows on this pattern – can’t tolerate many more of those episodes or I’ll rip the whole sucker out and do something else! (Oooooooops, did I say that out loud? . . . hehehe, blush). Snow Day and thinking of what’s for dinner – last night I tried something for the first time – Veal Parmigiana. Youngest son had it at a friend’s house and raved, so I decided to give it a try. His was a quick version, and so was mine: bought 6 already breaded veal patties, a jar of spaghetti sauce and a package of already shredded Parmesan cheese. Put the patties in a 9 x 13 inch greased pan, spread sauce over all, then covered with shredded cheese and baked 350 degrees for about 35 minutes when cheese was melted and brown. The guys LOVED it! (I was so-so, next time I think I’ll try the chicken patties). It was quick, easy AND it only cost something like $6.00 for four servings, 2 patties each! Yes, I watch Iron Chef, and lots of other cooking shows and know that there’s a longer version involving buying and pounding out your own veal cutlets – but that’s not for me. Grease 9 x 13 inch. baking dish. Combine enchilada sauce & sour cream in medium bowl. Combine evaporated milk, cheese and chilies in medium saucepan. Cook over medium heat, stirring constantly, until cheese has melted and mixture is smooth; remove from heat. Spread 1 Cup enchilada sauce mixture on bottom of prepared baking dish. Layer with 4 tortillas, 1 Cup enchilada sauce mixture, 1 1/2 Cups chicken, 1 C. cheese sauce; repeat layers one more time, starting with tortillas. Top with remaining tortillas, enchilada sauce mixture and cheese sauce. Cover with foil. Bake 40 minutes. Uncover for at least 10 minutes before serving. Toss together all ingredients in large bowl. Refrigerate any leftovers. Serves 4. In large nonstick skillet, fry bacon over medium-high heat until crisp, about 8 minutes. Remove and set aside, reserving bacon fat in the pan. Add onions and salt, reduce heat to medium-low and cook, stirring occasionally, until onions have softened completely and turned brown (about 20-30 minutes). Increase heat to high, add spinach and bacon; cook, stirring frequently, just until spinach has wilted, about 5 more minutes. Add additional salt to taste and serve immediately. Serves 6.
cheese and add crushed Oreos a little at a time. into melted almond bark. Place on waxed paper until firm. Place potatoes in medium saucepan of salted water. have a golden brown crust, about 2 minutes. Going along “Swimmingly”, thank you! 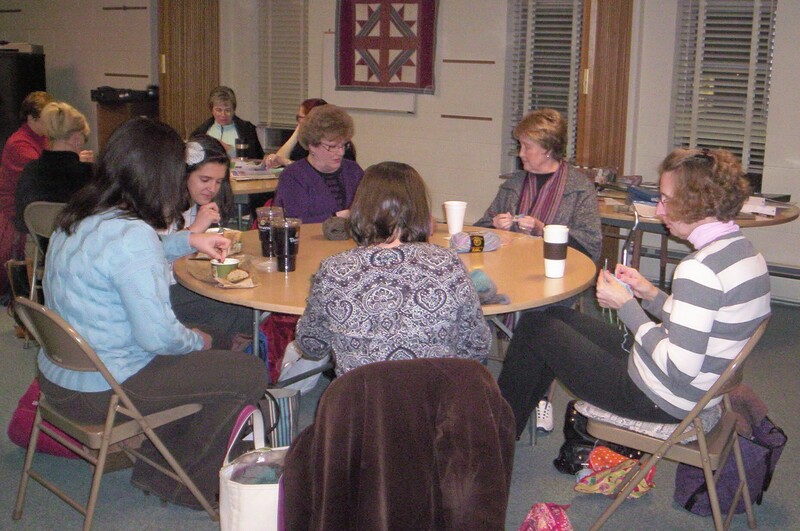 Last night was my knit group’s second meeting in the new location. Armed with my brand-new church key (not the old connotation of that word, mind you) I opened the front door and quickly familiarized myself to the locations of the many light switches and thermostat (must be turned up, as it automatically goes down to 60 degrees at 6 p.m. – brrrrr!). Got the room set up to my liking and very soon many ladies came in the door, happy to be there. We had four new people show up, which was a nice surprise. Turns out I knew 2 of them, a mother and her young daughter, from back when I was homeschooling – well, actually we ‘sort of’ knew each other, as in “I remember seeing you with that group, back then” but not really knowing each other’s names, etc. Just to give you a ‘feel’ for the new place, here are photos of the evening. We ended up having 21 people – that’s a good number, I think! I don’t usually get to watch movies on tv very often, but the other night I happened to be able to and clicked onto what turned out to be a very enjoyable one: “The Holiday” (2006) with Cameron Diaz, Kate Winslet, Jude Law, Jack Black and Eli Wallach. I would thoroughly recommend it – it has a rather ‘sweet’ theme, mixed with a bit of ‘crazy’ (Jack Black) with a bit of spice – a fun ‘chick flick’, for sure. Been spending time these past two days attempting to ‘learn’ how to move large groups of photo files from one site to another. After dropping a comment on Facebook about said dilemma, my sister-in-law in Wisconsin, emailed saying “It’s easy!” (Yea, maybe to HER!) I’m now awaiting the final outcome as she tells me she should be able to do this ‘feat’ in about 10 minutes and call me with the results. We’ll see…the idea is: I’m trying to move all of my knit group’s old photos (about 3 1/2 YEARS worth) from our current website, to the new (FREE) site. My problem lies in the fact that the new site is set up totally different. (as my sister-in-law commented: “Well – you get what you pay for…” me: SIGH!). 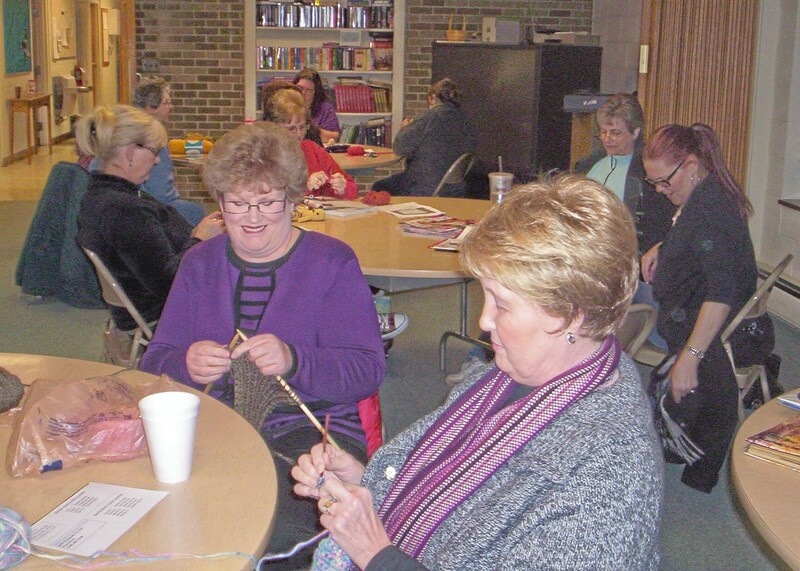 Our current website is paid until May, so I have time to get this figured out – stay tuned for the ‘further adventures of “Knit Group Woman and Her Crazy Photo Files”! food cake mix into  above ingredients and stir together. Place into well sprayed 9x13 pan. Bake about 35 minutes. Check with toothpick test. Cool. when cool enough to handle.Reserve 2 T. bacon drippings. stirring constantly; reduce heat and simmer 15 minutes. Add salt, pepper and cheese; stir until cheese is melted. or until chicken is no longer pink and juices run clear. from soup, and allow to cool long enough to be handled. of sour cream, and crushed tortilla chips, if desired. 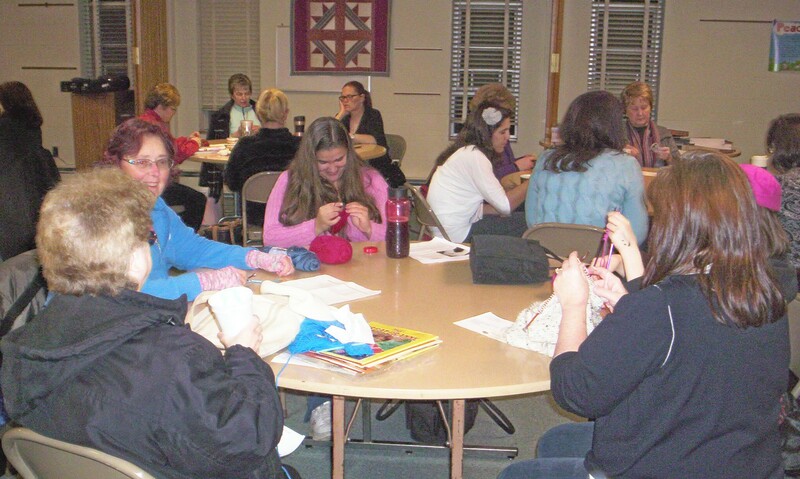 Tonight is knit group in the new location and it looks (from our website entries) that quite a few people will be attending – I’m thrilled! Upon organizing all the ‘stuff’ I have to remember to take tonight I suddenly realized it’s been 4 weeks since we last met there! (Meeting canceled due to big snowstorm). After that thought it also occurred to me that it’s been two weeks since my special needs group met, once due to the snow storm and the next week due to extreme cold conditions! Guess I’ve had a mini-vacation from both groups and didn’t even realize it! Go figure! Have done some catching up on sewing together afghans, working on #274, taking #273 with me tonight to knit group to crochet on the border. OH! Meant to say – the two breakfast breads I posted last turned out really TASTY!!! I will definitely make the blueberry one again – the quicker the better (can you tell I loved it!?). They both were moist, but the blueberry one was really moist (there were only 3 pieces left after Sunday School! about 4 pieces of the banana). I don’t mean to be ‘ringing my own bell’ here – those were recipes I’d gleaned off the recipe sites I subscribe to – I HAD NOT tried them before, so was very pleasantly surprised at how very yummy they turned out. In small bowl, combine cream cheese, 1/4 cup sugar and egg; blend well. Pour over batter in the pan; carefully spoon jam evenly over cheese filling. In a small bowl, combine 1 cup of reserved flour mixture and almonds; sprinkle over top. Bake 55-60 minutes or until cream cheese filling is set and crust is deep golden brown. Cool 15 minutes. Remove sides of pan. Serve warm or cool. Cover and refrigerate leftovers. Yield: 16 servings. Bring all ingredients except cheese to a boil in a medium saucepan. Simmer on low for 25 minutes or until vegetables are tender. Stir in 1/3 C. cheese. Serve in bowls; top with remaining cheese. Serves 4. Stir picante sauce, soup, chicken, corn, beans, water and cumin in a 4-quart slow cooker.Cover and cook on LOW for 4 to 5 hours or until chicken is cooked through. Stir the tortillas, cheese and cilantro into cooker. Cover and cook for 15 minutes. Serve with additional cheese, if desired. of mixer until light and fluffy (about 2 minutes). beating at low speed until well-blended. until lightly browned. Cool crust on a wire rack. mix in a large bowl. Stir in the orange segments. Spoon orange mixture over crust, spreading evenly. Top with whipped topping. Chill 1 hour. until beef is no longer pink; drain. sauce and rice; simmer until rice is done. sprinkle on top and refreeze. to me - hence, I posted them for you! Enjoy! I volunteered to bring Sunday School snacks for tomorrow and, being I’m ever-frugal, couldn’t justify just buying already-baked goodies straight off the shelf, so I’m doing what the title says. Have a great-smelling ” Blueberry Breakfast Bundt Cake” in the oven and am waiting to put in the “Banana – Walnut Crunch Cake” next. Mix all ingredients except blueberries in a bowl. Add berries last, fold in gently. Spray nonstick cooking spray in bundt pan and spread in blueberry mixture. Bake 55 minutes or until center isfirm. Let cool 10 minutes or so, then turn out onto plate. Mix together and drizzle on top of cake. Spray Bundt pan with nonstick oil. Combine topping ingredients and mix well. Pour mixture into bottom of Bundt pan and spread. In large bowl combine cake mix, walnuts and cinnamon. Add eggs, bananas, water & oil; mix 2 minutes or until well blended – pour into prepared pan. Bake 50-55 minutes or until toothpick comes out clean. Carefully invert pan immediately onto nonstick cooling rack. Cool 30 minutes before slicing or serving. There you have it – two very yummy-sounding cakes! It’s a lovely and semi-warm (for here, anyway) day outside – sunny (30 degrees!) so when the cakes are baked I’m going back to sewing together another afghan – this one’s #273. It’s been a sort of ‘odd’ week – busy, then not, really busy driving all over the place, then staying at home putting an afghan together – nothing much to ‘write home’ about. Played many board games with my grandson yesterday, the winner getting 1 M & M each game (the bowl only had about 9, total but was empty when we finished!) Yes, once again, he won great amounts and I only won 2 games, but that’s OK, too. We also played with his ‘cooking stuff’ and, as he told his dad later, he was doing his ‘Cheffing – cooking’! He’s a ton of laughs to be around. Not much new snow (YAY!) and FINALLY our driveway is getting to where you can actually turn around without getting stuck each time – but then, you still have to gun the engine at the bottom of the driveway in order to make it up ‘the hill’ without ending up ‘stuck’. Ah, the ‘fun’ of winter, eh? Finished another afghan yesterday (#272, I think) with, of course, many, MANY more in the future. Haven’t done any more knit ‘heart’ squares for my friend’s husband’s special afghan. We got word yesterday that he made it through the mechanical heart surgery just fine. What I didn’t understand was that this is only a temporary fix until he can get a real, human heart – that’s a bummer! This LVAD machine is helping his own heart function until that time. I don’t know if that means he’ll be hooked up to a machine AND in the hospital during all this, or not. I’m just grateful he made it through the surgery. Word is he’s in great pain, on 3 types of pain meds. but that’s understandable, since they have to break his rib cage to get at the heart . . . OUCH BIG TIME! On a lighter note, have lots of really yummy sounding recipes for ya! cook on High for 5 to 6 hours, or Low for 9 to 10 hours. until the pasta is cooked, stirring occasionally. measuring cup, and level with a knife. with a fork until moist and crumbly. oat mixture. Cover with foil; bake 30 minutes. a spatula. Stick the bacon strips into the potatoes. and bacon is crisp. Serves 4 to 6. *Salt and pepper is however much you want. Refrigerate. Be sure it has thawed before serving! That’s my day, thus far. Husband and middle son got home after all the snow-removal; they didn’t even notice the tons of snow in the road OR the extra snow removed from the bottom of the driveway. Oh well – just glad they’re home safe! As per our ‘usual’ Michigan winters, it’s a lovely sunny day – the snow is glistening like tiny diamonds; we’re here in our nice, warm home (Thank You, Lord!). Oh, and did I mention it’s a ‘balmy’ 9 degrees F.? Seems like when we get big snows, we also get low temperatures, but that’s OK – we’re a hardy breed and used to ‘weathering’ the storms. All is well here; thus far none of us have had to leave the house except middle son who had to go to work several days. The driveway is clear of snow (from all our shoveling the other day) and, thankfully, we didn’t get any MORE snow! 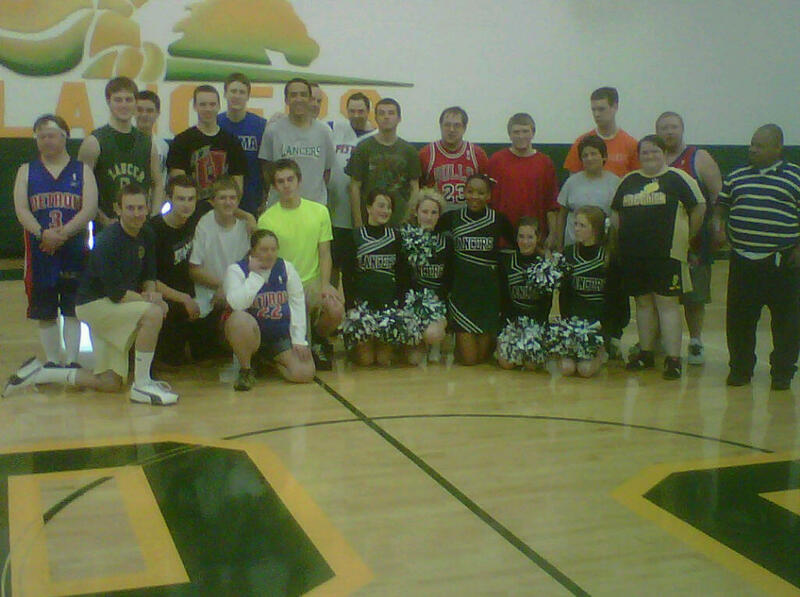 Tomorrow night is my special needs group’s “Basketball Game”… I should say that, to them, it is “THE” Basketball game of the Century! (if you’re a reader of this blog, you’ve seen the photos of previous games). My group LIVES for this game, so I’m really hoping I’ll be able to attend (and no snow hinders my driving). While languidly spending the last few days knitting, reading, cooking meals and reading emails, quite a few really tasty recipes came to my attention, so I’ll (of course) share them with you! Spray inside of slow cooker with nonstick cooking spray. In a large skillet brown ground beef with onion and garlic. Drain well. Stir in taco seasoning, salt and pepper. Place three tortillas in bottom of the crockpot. Top with beef mixture, broth, tomato sauce and enchilada sauce. Sprinkle with 1/2 c. of the cheese, layer three more tortillas. Top with beans, corn, chilies, half of the olives and 1/2 c. of cheese. Top with remaining three tortillas, sprinkle with remaining cheese and olives. Cook on high for 2 1/2 to 3 hours or on low for 6 to 7 hours. Uncover the crockpot for last 30 minutes of cooking time. Serve with sour cream. In a bowl, combine the flour, brown sugar and pecans. Stir in butter; mix well. Set aside 1/3 cup for topping. and sugar. Beat in the egg, milk, lemon juice and vanilla. Pour over crust; sprinkle with reserved pecan mixture. Bake for 20-25 minutes or until firm. Cool on a wire rack. Cut into 16 squares, then cut each square in half diagonally. until combined. Transfer to a greased 13x9-in. longer or until golden brown. Place chicken breast halves on a medium baking sheet. add apples, brown sugar and apple juice. Cover; cook on high for 4 to 5 hours. Serve with mashed potatoes. Serves 12.
and alfredo sauce mixture over noodle layer and spread evenly. top is brown and bubbly. Lightly scrub mushrooms; remove stems & reserve caps. Finely chop half of the stems,discard remaining stems. cheese, butter and onion; mix well.Spoon about 1 tsp. over medium heat; brown stuffed chicken breasts. gravy over chicken, and garnish with parsley. onion and bacon over beans and carrots, and serve. baking powder, and salt into a 9-inch square pan. Stir in milk, butter, and vanilla; spread evenly in pan. Combine next 3 ingredients and sprinkle over batter. Pour water over top. Bake 40 minutes. Now that you're all 'droooooling', I'll close this post. never know - retirement can be a good thing! So . . . How did you fare? Now that we’ve survived what was being called “Snowpocalypse” and many other not-too-nice names, how did YOU fare? We arose today and peered out the window to (of course) a sea of white – BUT not the HUGE/MEGA sea we’d been expecting. I’d say our little ‘patch of heaven’ got about 6 inches, which was all fluffy, easy-to-shovel stuff. Our only ‘problem’ came around 10:30 a.m. when middle son had to go to work (YES, his store was open – they never close except Christmas day!) I kept trying to remind him that he needed extra time to clean off his car and manage the roads (but do grown children ever listen? ); of course he left almost late (his work, on a good day, is about 5-6 minutes away) then promptly got stuck at the end of our driveway and had to pushed out after we had to shovel around and under his (lightweight) car. Apparently he had attempted to back out into the street and didn’t get a good shot at it (remember, we live on a major road – 45 MPH traffic so you can’t just pull out easily) so he decided to try to go forward up our hill and then slid into the side of a snowbank! About 20 minutes later he actually made it out onto the road and on his way to work – AFTER the remaining 3 of us at home shoveled and pushed. Hey, ya do what ya have to do to get the job done! (and here I was thinking I wouldn’t have to shovel today, being my husband and two sons were home!) Oh well . . . Much to my surprise about 3 hours later he came strolling in, saying they sent him home – they only had 16 customers in three hours and didn’t need him! WHO goes out shopping in this kind of weather? I ended up going to the local grocery yesterday just before the big snows started because a friend called; they needed a few staples and didn’t have a ride to the store. I was a bit amazed at the amount of people crowding the store (I actually got the last grocery cart at that time!) The people were amazingly polite and respectful of each other, which was a good thing to see (sometimes in these types of situations, people tend to get pushy and territorial). I got in and out of the store in about 25 minutes, delivered their groceries and was back home in about an hour! Still very grateful we had heat/electricity/phone service/food/shelter, etc. Popped a pork roast in the crockpot and had mashed potatoes & carrots to go with it. Nice, easy-going day (if you don’t consider the shoveling and car-pushing part…but even that wasn’t bad – the guys took ‘pity’ on me after about 10 minutes and sent me back in the house!). Had to phone all the students in my special needs group to make sure they (or their families or caregivers) realized the church would be closed tonight and our group wasn’t going to be there. Worked on another knit 10″ x 10″ afghan square for my friend (this pattern is a bit complicated, but it will look nice when it’s done – I’m taking it slow), started reading a book I had in our ‘library upstairs’ (I read it probably 10-15 years ago but it’s still a ‘goodie’ – I count it a good book when I don’t remember any part of it when I re-read it! ), and then perused my emails, Facebook and played a few games of Spider Solitaire – really hard day for me, eh? Hope you all had a fairly uneventful (except for the snow) day. Just checked the school site – apparently, youngest son’s school is closed tomorrow, also. No, wait . . . he just asked me to re-check and apparently they’ve changed their minds – there IS school tomorrow! Oh joy . . . that means I will be out driving him tomorrow night for his practice (school closed/no practice . . . school open/practice). Oh well, such is life, eh? Hopefully by tomorrow evening the roads will be much better and I’ll be able to get him over there without getting stuck! I certainly wouldn’t have wanted to need AAA towing today – I’m guessing there would be a good 2-3 HOUR wait! Thank the Lord for small blessings, eh? Stay warm, enjoy your day/evening!